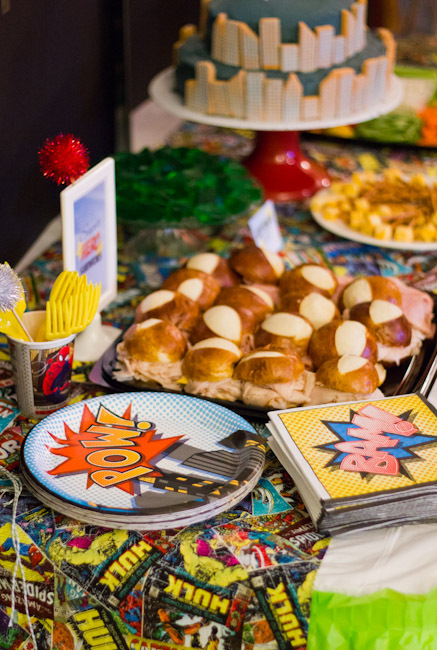 Chances are you are going to be involved in some sort of superhero celebration at some point in your life, if you haven’t already. 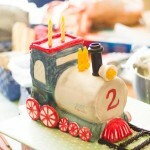 My son turned 4 at a rather inconvenient time for us. I was just returning from SNAP! conference, I am great-with-child, and on top of it all my husband got called out of town for work last minute. 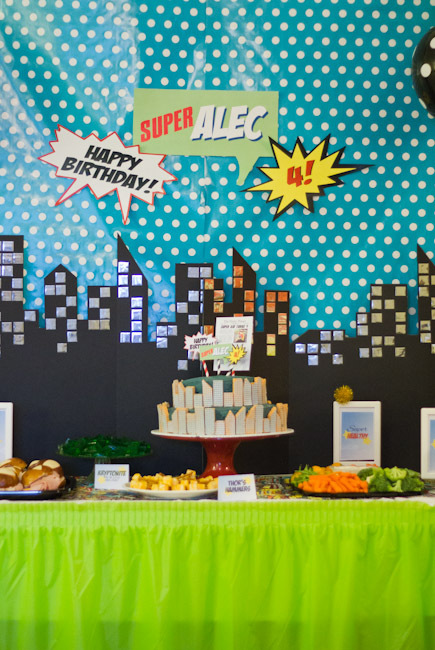 Knowing this wasn’t going to be an easy time to have a party but not wanting to deny my son what has become a family tradition, we settled on a superhero theme, partly so that we could borrow a lot of the supplies from my brother-in-law’s 30th birthday last fall to make it easier. Also, Birthday Express offered to send some supplies to help pull it all together, which saved me a bunch of shopping trips and made this much more doable. Lastly, if it weren’t for some good friends who helped with set-up and take down, we couldn’t have pulled this off this year. Of course, this is more of a commentary on my physical state than on the party. 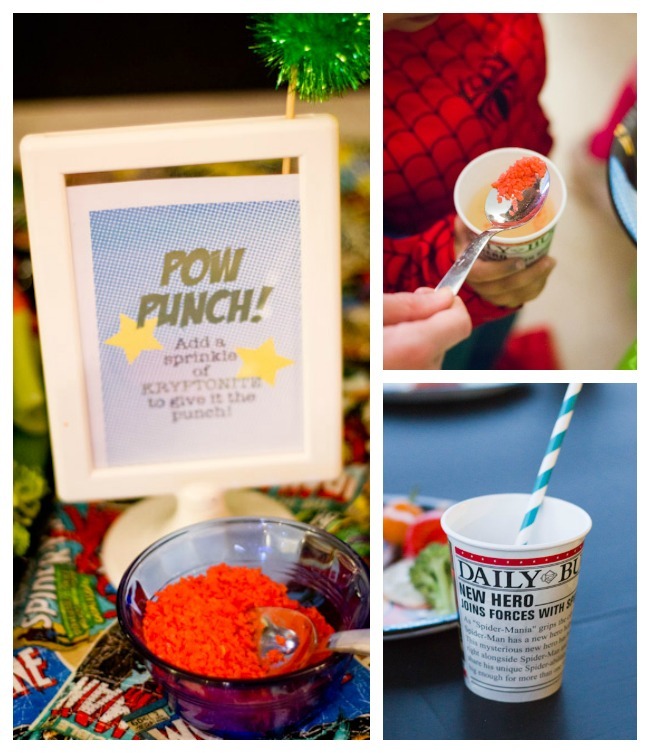 Many of these ideas were pretty simple to execute–especially since they had to be–so hopefully you will find lots of inspiration for your next superhero bash, whether it is a good time for a party or not in your world. Invitations were digital this year, which I don’t like to do, but sometimes it is the only way. 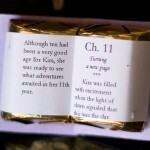 However, digital invitations don’t have to be boring! I designed this newspaper, which ended up serving many purposes, to attach to the digital invitation. You may have heard of this trick by now, but you can go to most copy shops and as for an engineering print of a file for just a few dollars. They will only print in black and white, but it is a great way to get a large-scale focal point without breaking the bank. 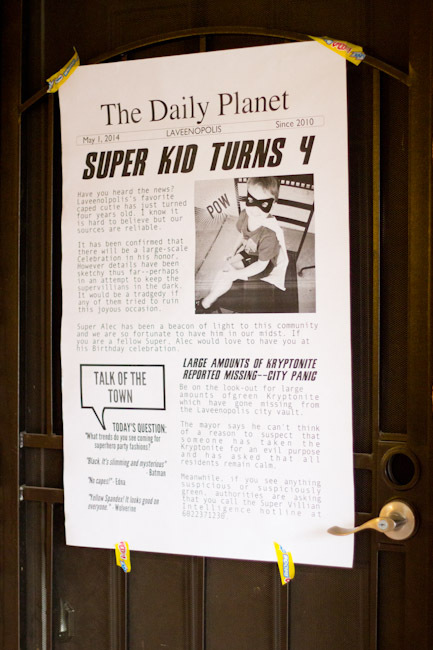 So I had the same newspaper file printed big enough to cover the front door of the party and make sure everyone knew the super-news! It is attached with superhero designed tape. 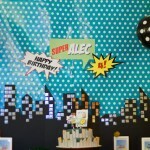 The black cityscape backdrop was among the party supplies I re-used from the Superhero 30th party. My SIL made them out of black tri-fold project boards. They are quite ingenious, because they can stand-up on their own and look very sharp. I’m not sure if she used a punch to make the foil square windows, but that would work or just cutting squares out of an adhesive-backed sticker sheet would also do the trick. 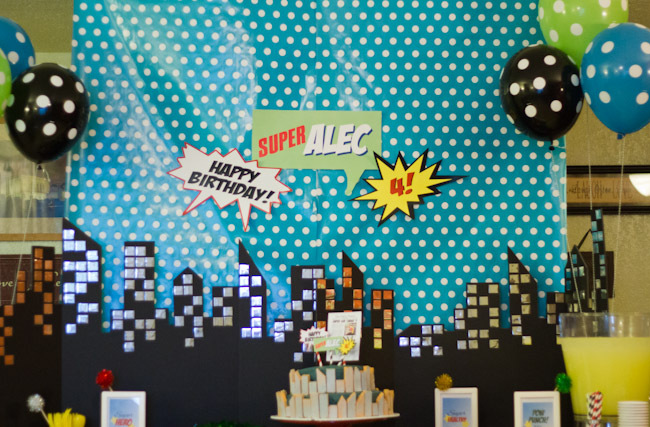 The polka-dotted balloons on either side of the table come from Birthday Express and play up the dots of the comic book theme. The green table skirt was also from Birthday Express and finishes everything up nicely. 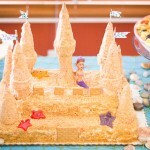 The cake was one of my favorite ideas for this party because it is something that looks special but was really pretty easy. I had my daughter bake the layers of cake and I frosted them with a rather nondescript grey-blue frosting (I was going for dark blue, but didn’t really have the right colors on hand). The whole thing looked pretty ugly until we added the “buildings” all around. If you can’t tell, the buildings are just those wafer cookies you can find in any store cut to different heights and angles to make the various buildings. The photo doesn’t show this very well, but to make them look more like buildings we sprayed each one with edible silver spray paint. (I only had one can of paint. You might want two for more complete coverage.) The cake was inspired by this one by Chicken Babies I found on Pinterest. 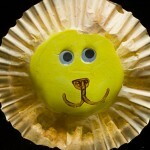 You’ll probably recognize my cake toppers. 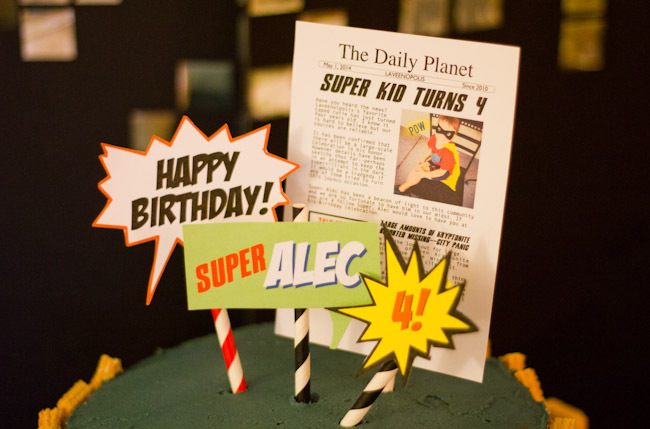 I just took the signs and newspaper I had designed and printed them small-scale and attached them to striped straws to insert into the top of the cake. 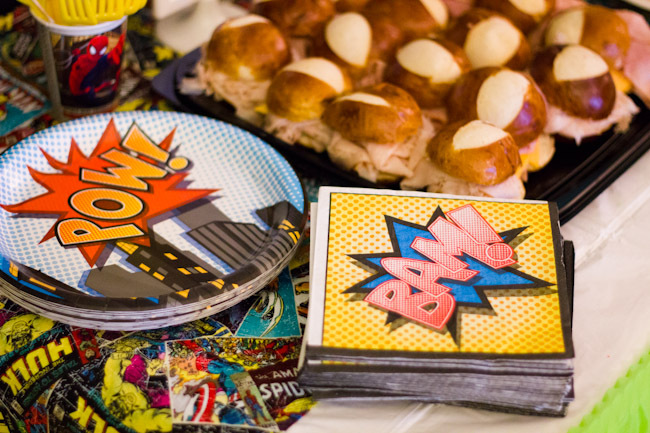 I found these really fun superhero themed plates and napkins at Birthday Express that went right along with the comic book feel of the party! The table runner underneath was from the 30th birthday. 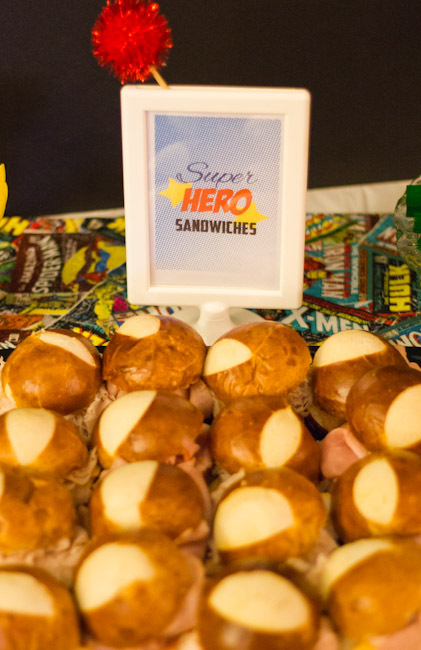 For food, I knew I needed to serve super-HERO sandwiches. Since there were a lot of young children at the party I opted for this tray of pretzel roll sliders from my grocery store as opposed to a long sub sandwich because I thought they would be easier for little hands to manage. And you heard that right! I ordered food trays. Sometimes you just can’t DIY it all. 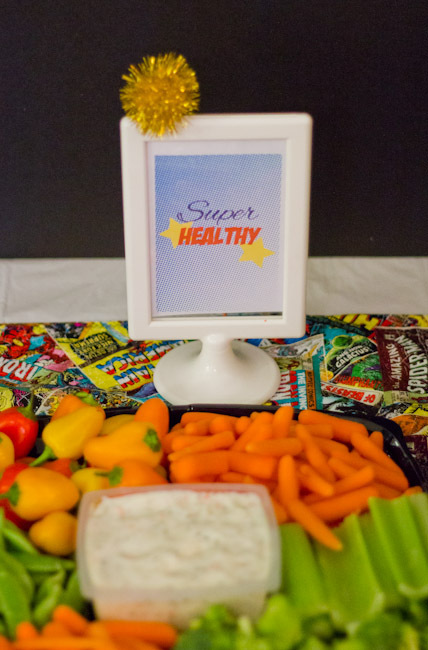 The easy way to get some veggies on the table and keep with the theme is to make a sign that said “Super Healthy” to put with the vegetable platter. 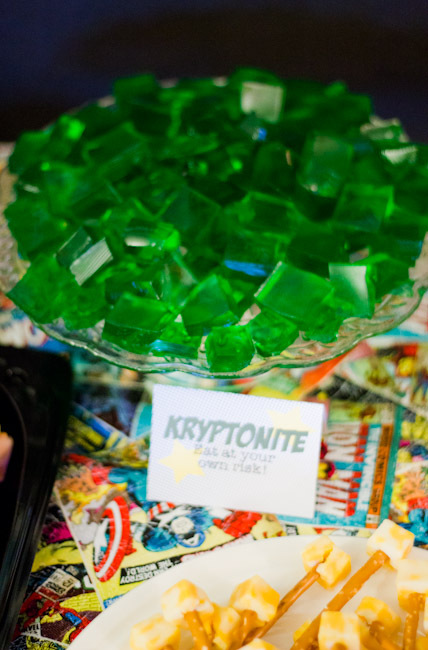 Of course, we had to have green Kryptonite jello for those who were brave enough to eat it. Follow the Jiggler recipe on the back of the box to get a texture that will hold it’s shape and can be eaten as finger food. You can’t see these too well, but at the bottom of the picture are our “Thor’s hammers”–just cheese cubes on pretzel sticks. I wanted to do something kind of exciting for drinks, but not too complicated. I read on-line that adding pop rocks to lemonade would create quite a reaction so we let everyone mix their own explosive concoction. 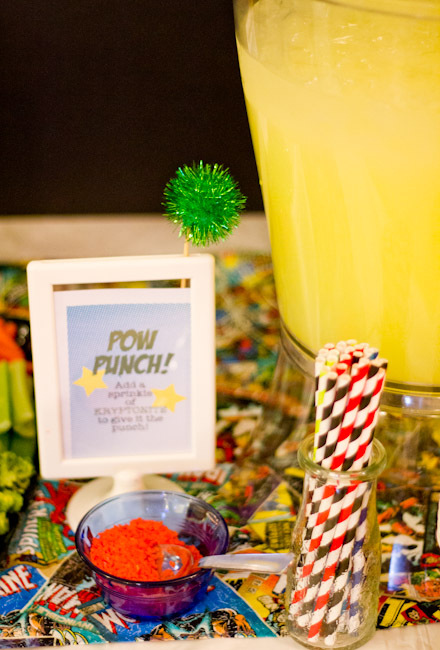 It only takes a small spoonful of pop rocks to get keep the lemonade crackling for quite a while. I did make a bit of an error here though. The Pop Rocks were watermelon flavored and came in a green package so I assumed they would also be green, like Kryptonite! So my sign says to add Kryptonite. Are there any comic book buffs who can tell me if there is some magical red Kryptonite in a story somewhere? Maybe ours was painted red to conceal it’s power??? Or you could make things easier on yourself and buy the green apple Pop Rocks, which I believe to be green inside and out. The cups were from a Spiderman line at Birthday Express, but I liked how the newspaper tied in with my newspapers. To top it off, there is a place to write each child’s name. I had what I still think is a brilliant idea for the eating tables, but it didn’t photograph as nicely as I had hoped since we were trying not to get blown to Kansas until the sun set and the winds died down. 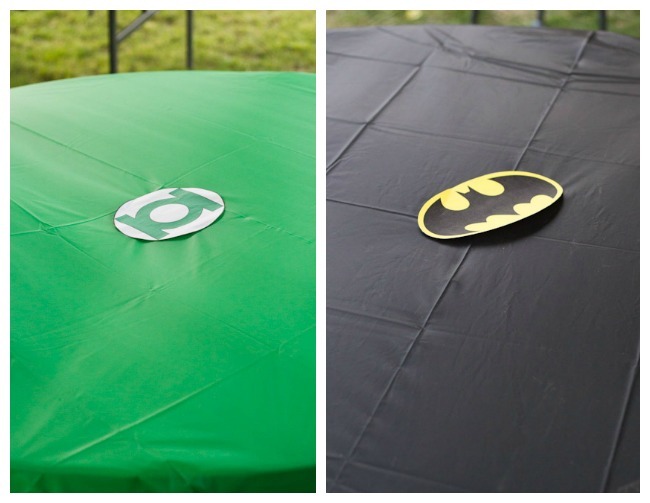 We had four round tables and for each table, I used a plain colored plastic round table cloth (from Birthday Express) and taped it around the edges (I was planning for wind, just not so much!). in the center of each table we placed the emblem of a different superhero that I printed from my computer. Pictured are Green Lantern and Batman. The red table had a Flash emblem (my son says that he is the favorite because he is fast), and the blue table had Batman. 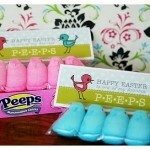 It is an inexpensive way to add some color to the party. 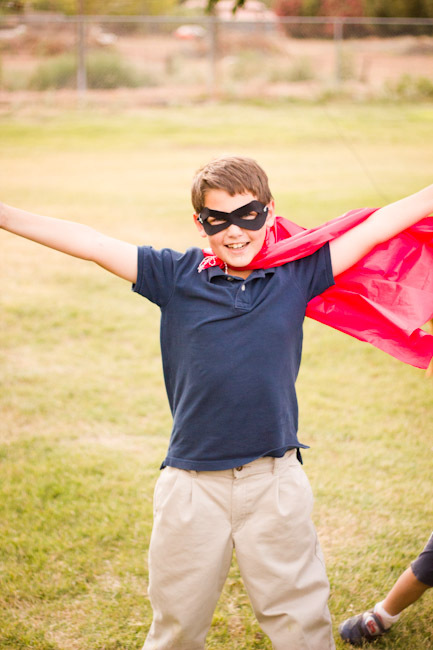 The kids had a blast running around outside–especially once they were properly adorned with superhero capes and masks. 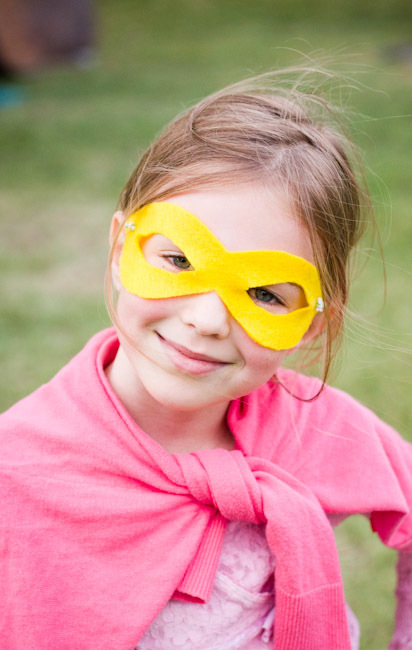 We did these about as simply as we possibly could–cutting masks out of felt and tying them with twine. The capes were cut out of extra plastic tableclothes. So maybe not keepsakes forever, but it was fun for the kids to choose their colors and create their own superhero persona. 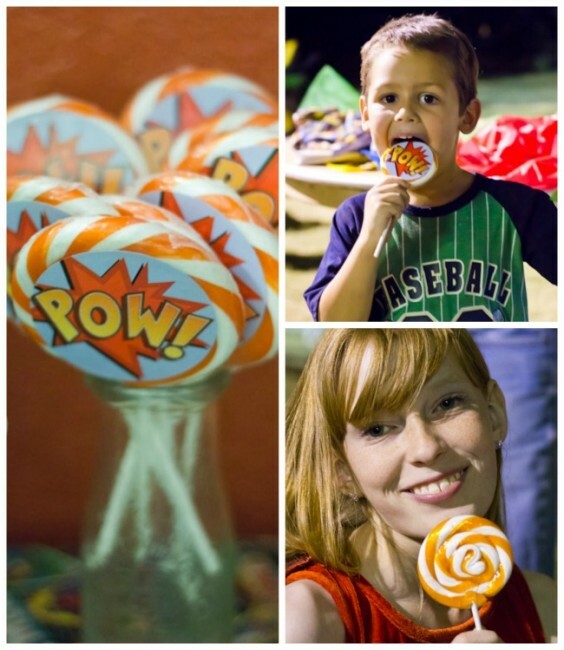 Games might be a little different for this age group than they were for the 30th party. 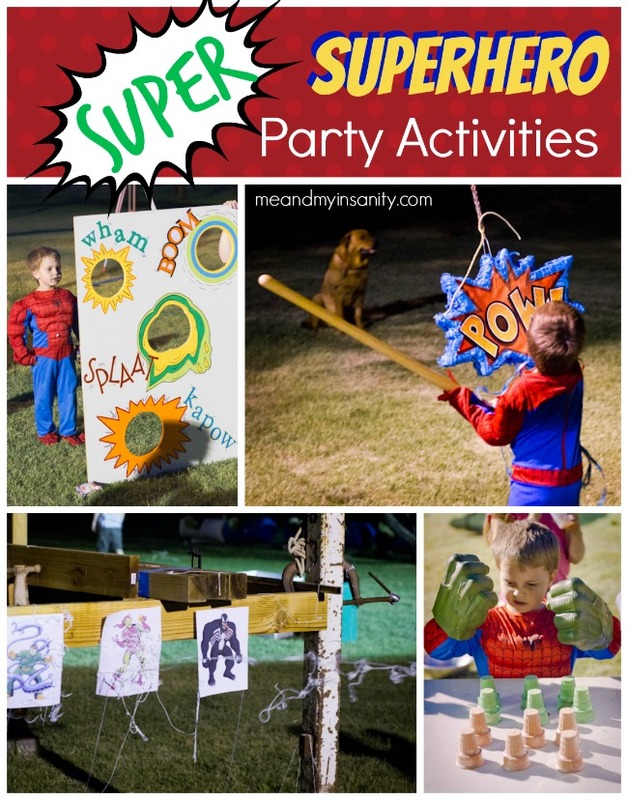 We did reuse all of the bean bag tossing games my SIL had made for the kids there (go to this post to see Hulk and Captain America). The kids loved our Hulk smash game! There wasn’t even much of an objective, except to let them put on the Hulk fists and see how many ice cream cones they could smash in 30 seconds (NOTE: it was a lot, so if you have many kids you might want to invest in a lot of ice cream cones.) The other big hit was the Spiderman web-slinging challenge. We pinned up some pictures of some of Spiderman’s enemies and took turns spraying them with Silly string. It looks a lot like Spidey’s web to me! My kids love to have a piñata at every party. I was happy to find this POW one and some Spiderman candy filler at Birthday Express. Perfect for this party! 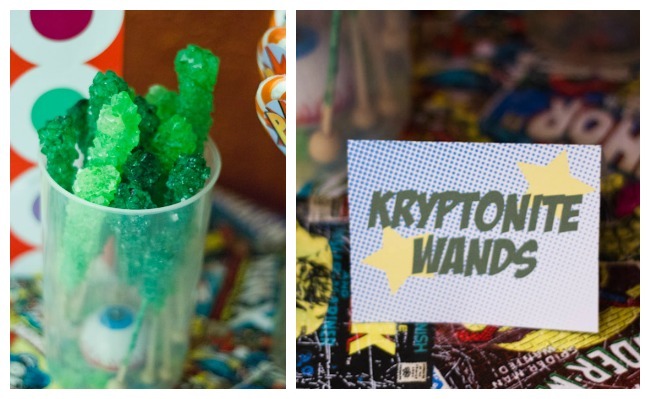 And as if that wasn’t enough sugar, guests had the option of taking home one of these giant “POW” suckers or their own Kryptonite wand (green rock candy), both from Birthday Express, as a favor at the end of the party. 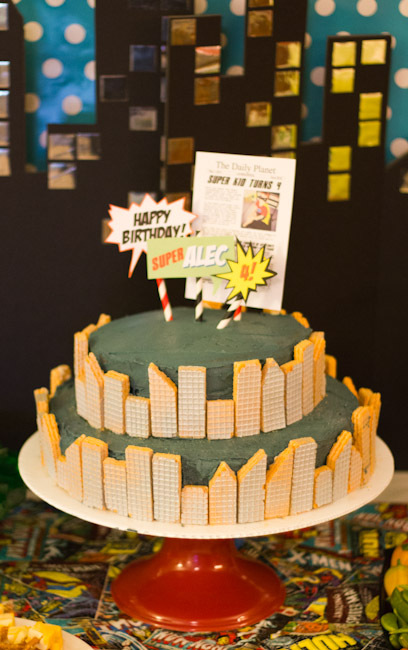 All in all it was a SUPER party! The birthday boy was SUPER happy! And I was SUPER exhausted. 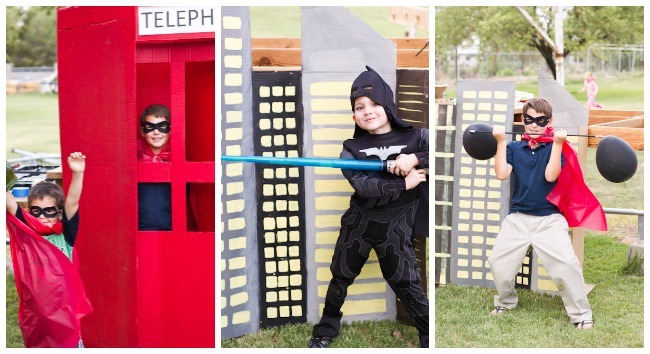 Being a SUPERmom isn’t for the faint of heart (or largely pregnant), but it feels great to celebrate these crazy kids each year in an imaginative way! 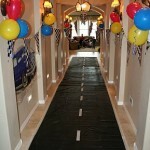 DISCLOSURE: Thanks to Birthday Express for providing many of the party supplies for this party. I was able to select from their inventory to add to my party vision. All of the opinions in this post, and most-definitely the Insanity are my own. Hi! 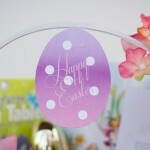 Do you happen to have printables for your awesome signs?! I do have several files. I haven’t posted them yet. 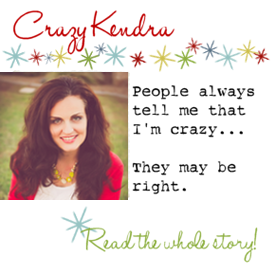 Email me at kendrascreations@gmail.com and I can send the ones you want. Thank you! 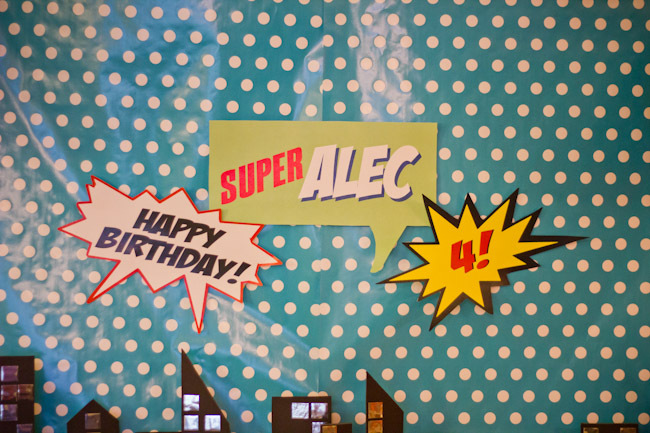 I was doing things last minute and was in a rush so I figured out some other printables to use this past weekend for my son’s birthday. actually sit in the Chair and have a solid idea of your own comfort level in that model. ” Despite the name, however, the palms and thumbs can be utilized in Shiatsu massage in addition to the fingers. Just came across this while looking for ideas on Pinterest. Really awesome stuff! Thanks for sharing! Also, I know it’s been over a year, but in case you haven’t found the answer to your red kryptonite question yet: Batman created red kryptonite by exposing it to radiation. It’s meant to immobilize Superman if he ever goes crazy. It turns his skin transparent, causes him intense pain, and overloads his solar absorption, causing his super powers to be too overwhelming for him to function properly. I’m sure your “red kryptonite” didn’t have the same effect on the kids. Thanks again for sharing this!